When I started reading, I didn’t know entirely what to expect. I hadn’t seen the movie before, although I had heard that it was about gay cowboys. I’ve never been that keen on cowboy movies, so I never bothered to see it. 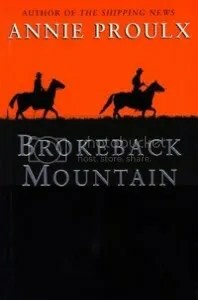 “Brokeback Mountain” is a far more powerful story than I expected. The two main characters, Ennis and Jack, meet while working as ranch hands one summer, and develop a relationship. Each thinks that he can go back to his normal life after the summer ends, only to find that life really isn’t that simple. They each marry and try to have families, only to find that their marriages fail. The two men continue meeting for summer camping trips as a last-ditch attempt to be together, realizing that it wouldn’t be safe for their relationship to be in the open. The ending made me cry. I think that one of the things that makes this story so powerful is that Ennis and Jack are just two lower-class rural guys who don’t stand out in any way. Both of them seem like stereotypically masculine cowboys who just happen to be in love with each other. They spend their lives seeking personal fulfillment, leading double lives out of concern for their own safety until tragedy strikes. It’s a good choice for anyone interested in cowboys or reading stories with GLBT themes.